RF Cool Tools Real-Time-Design is a self installing application allowing the user to design a passive RF two-port network using passive RLC components as well as two port s-parameters. Component values can be adjusted and the resulting change can be displayed in real time in one of three types of output plot windows. The plot window types include: Smith Chart, 20*log magnitude, phase (degrees/radians), group-delay, VSWR and much more. S-parameter bisection feature splits a two port into two equal halves. The basic Real-Time-Design is free to use, but needs an Internet connection to launch it. Before clicking the Launch button, please take a moment to look through some program screen shots , or view some how to videos. "It is highly recommended not to run these types of applications. However if you still want to run these apps, run only if you understand the risks and implications. As a workaround, you can use the Exception Site list feature to run the applications blocked by security settings. 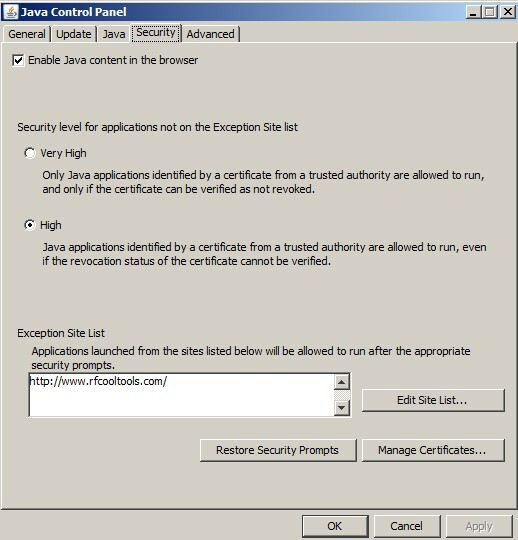 Adding the URL of the blocked application to the Exception Site list allows it to run with some warnings." I spent thousands of hours writing this software for myself and others to use, so If you still want to run this software you can do the following. -> in the Start menu search "configure Java"
NOTE: Include the "http://", and "www" as well. If it still does not work remove the "www"